Formed in 1983, Canada's Glass Tiger have achieved multi-platinum status in their homeland, mostly thanks to the popularity of their debut record 'The Thin Red Line', but here in the UK, they're predominantly known for their hit single 'Don't Forget Me (When I'm Gone)'. Following another two highly successful albums, the group went on hiatus in 1993, but reformed ten years later and have been active ever since, still including original members Alan Frew (vocals), Sam Reid (keyboards), Al Connelly (guitar) and Wayne Parker (bass). The band intended to write and record an album of brand-new material to coincide with the 30th anniversary of their debut, but unfortunately, the project was put on hold to let Frew recover from a stroke. However, they eventually entered the studio and '31' is the end result, the title obviously referring to the number of years between their breakthrough and the studio sessions that yielded the record. 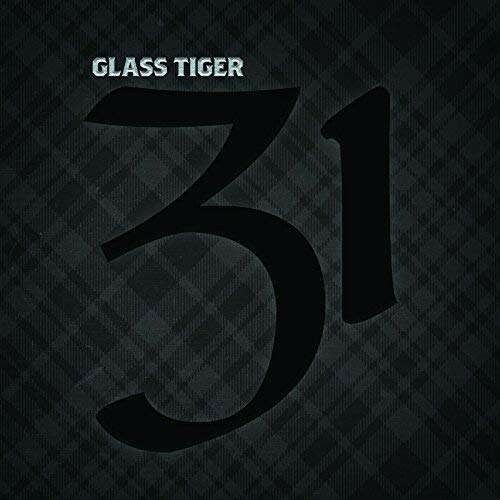 Though essentially a "greatest hits" collection, all of the songs have been completely re-recorded, relinquishing the dated eighties sound and embellishing them with an acoustically-driven, distinctly Celtic Folk feel, something that has always been prevalent in Glass Tiger's music but not quite to this extent. Completely instigated and overseen by Scottish Country artist Johnny Reid, the re-imagining works brilliantly and breathes new life into some classic songs, and stripping away the eighties-sounding production in favour of a more organic approach actually makes you take more notice of the lyrics. In addition, Frew's vocals sound amazing, and he seemingly shows no signs of his recent health scare. While the likes of 'Don't Forget Me (When I'm Gone)', 'My Town', 'Diamond Sun', 'Someday' and 'I'm Still Searchin'' really benefit from the jaunty, Folk approach ('My Song' being very similar to the original), 'I Will Be There' and 'Healing Hands' are vastly improved from the originals by being transformed into heart-wrenching ballads, the slide-guitar textures adding a distinct Country sound. 'Thin Red Line' (featuring a guest vocal from Julian Lennon) is completely unrecognisable with the stunning new version being stripped down into a haunting, sparse ballad. This release also includes two new tracks, 'Fire It Up' and 'Wae Yer Family', the latter a really uplifting earworm of a tune, thus making '31' a worthwhile purchase. It's a little lighter than what we normally feature in 'Fireworks', but it's wonderfully melodic, feel-good music and that's really all that matters. This is a supreme re-imagining of some classic songs.